The Brownsea Island Scout Camp was the world's first Scout camp, and is regarded as the formal birth of the worldwide Scout movement. Robert Baden-Powell ran the camp from August 1 to August 8, 1907 on Brownsea Island in Poole Harbour on the South coast of England. 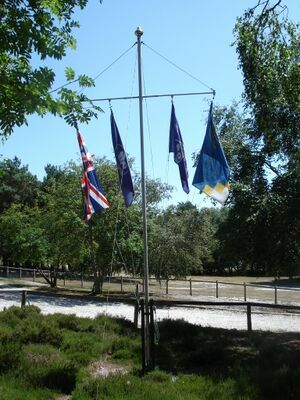 Many of the concepts still used worldwide in the Scout programme were first used at the Brownsea Island camp. The centenary of Scouting will be celebrated worldwide on the 100th anniversary of the start of the camp, on August 1, 2007. Baden-Powell had become a national hero as a result of his successful defence during the Siege of Mafeking of 1899–1900 during the Anglo-Boer War. During the siege, the Mafeking Cadets had impressed him with their resourcefulness and courage. He had also published a number of popular books on military scouting, including Aids to Scouting (written in 1899) which became a bestseller and was used by teachers and youth organisations. In the years following the war, he began discussing the idea of a new youth organisation with a number of people, including William Alexander Smith, founder of the Boys' Brigade. 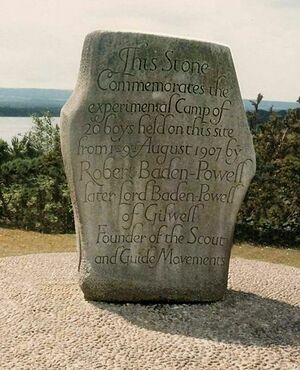 To test his ideas for "Scouting for Boys", Baden-Powell conceived of an experimental camp, and organised a camp to take place on Brownsea Island during the summer of 1907. He invited his life-long friend, Major Kenneth McLaren, to attend the camp as his deputy. Baden-Powell invited 20 boys to the camp, from different social backgrounds - a revolutionary idea in class-conscious Edwardian England. Ten came from the well-to-do public schools of Eton and Harrow, mostly sons of friends of Baden-Powell. Seven came from the Bournemouth Boys' Brigade, and three from the Poole Boys' Brigade. Baden-Powell's 9 year old nephew Donald Baden-Powell also attended. The camp fee was dependent on means: £1 for the public school boys, and three shillings and sixpence (17½ p) for the others. The boys were arranged into four Patrols: Wolves, Ravens, Bulls and Curlews. Brownsea Island covers 560 acres of woodland and open areas with two lakes. Baden-Powell had visited the site as a boy with his brothers, and the owner, Charles van Raalte, was happy to offer him use of the site. It suited his needs perfectly as it was isolated from the mainland and hence the press, but only a short ferry trip from the town of Poole, making the logistics easier. The boys wore khaki scarves and were presented with brass fleur-de-lis badges, the first use of the Scout emblem. They wore a coloured knot on their shoulder indicating their Patrol - green for Bulls, blue for Wolves, yellow for Curlews, and red for Ravens. The Patrol Leader carried a staff with a flag depicting the patrol animal. After passing tests on knots, tracking, and the national flag, they were given another brass badge, a scroll with the words Be Prepared, to wear below the fleur-de-lis. The camp began with a blast from a kudu horn Baden-Powell had captured in the Matabele campaign. He used the same kudu horn to open the "coming of age" Jamboree 21 years later in 1929. Baden-Powell made full use of his personal fame as the hero of the Siege of Mafeking. For many of the participants, the highlights of the camp were his campfire yarns of his African experiences, and the Zulu "Eengonyama" chant - meaning "he is a lion". Each Patrol camped in an army bell tent. The day began with cocoa, exercises, flag break and prayers, followed by the morning activity. After lunch there was a strict siesta, followed by the afternoon activity and tea. The day ended with games, supper, campfire yarns and prayers. Formation of patrols, distribution of duties, special instruction for Patrol Leaders, settle into camp. Tracking, memorising details, deducing meaning from tracks and signs, training eyesight. Study of animals and birds, plants, stars, stalking animals. Honour, code of the knights, unselfishness, courage, charity, thrift, loyalty, chivalry to women. Doing a "Good Turn" daily. From fire, drowning, sewer gas, runaway horses, panic, street accidents etc. First Aid. History and deeds that won the Empire, our Navy and Army, flags, duties as citizens, marksmanship. The participants left by ferry on the 9th day, August 9. Following the successful camp, Baden-Powell went on an extensive speaking tour arranged by his publisher, Pearsons, to promote his forthcoming book, Scouting for Boys. It initially appeared as six installments in a boys' fortnightly magazine, beginning in January 1908, and later appeared in book form. Scouting began to spread throughout Great Britain and Ireland, then through the countries of the British Empire, and soon to the rest of the world. In 1932, the new owner of the island, Mrs. Mary Bonham-Christie, allowed 500 Scouts to camp there to celebrate the Silver Jubilee of Scouting, but shortly afterwards, she closed the island to the public and it became very overgrown. The island was reopened to the public in 1963 by Lady Baden-Powell when it came under the control of the National Trust. Since then it has been maintained as a conservation area and is a popular site for visitors. It is accessible by ferry from Poole. The Scout campsite and parts of the island have been cleared, and Scouts have been able to camp there since 1964. A commemorative stone by sculptor Don Potter was unveiled in 1967. St Marys Church (about 0.2 miles from the camp) is lined with scouting flags from across the world. It is often used for services during large camps. There is a memorial to Baden-Powell and his wife inside the Church. The Brownsea Island Scout and Guide Management Committee maintains the site, and operates a small trading post on the site. In Spring 2007, the Baden-Powell Outdoor Centre will be built where the present trading post is, creating a more extensive visitors' centre and Scout museum. From the 24th March 2007, Brownsea Island will be open for day visitors (The island is closed to the public on the 1st August). The National Trust are operating a number of events throughout the summer months including guided tours, trails and activities in the visitor centre. Since March 2006, packages have been available for Scouts to camp on the island, while Scout and Guide groups can also book day activities. To celebrate one hundred years of Scouting, there are four camps which are being organised by The Scout Association during July/August. Pre-booking is required for these camps. The Replica Camp will run parallel to the three other camps (28th July-3rd August). Replica will be a "living Museum" and recreate the original 1907 experimental camp on Brownsea Island for visitors to the island. The Patrol Leaders Camp which will be held between 26 to 28 July 2007, will be the first of the four camps and involve Scouts from across the UK, participating in activities like sea kayaking. The Sunrise Camp (29th July - 1st August) will host over 300 Scouts from nearly every country in the world. The young people will travel from the World Scout Jamboree in Hylands Park, Essex to Brownsea Island in order to be at the birthplace of Scouting on the 1st August for the Sunrise Ceremony. Finally, the New Centenary Camp (1st-4th August) will host Scouts from both the UK and abroad and will celebrate the start of the second century for Scouting. Scouts from all backgrounds and religions will come together to show the world that peace is possible in the same way that Baden-Powell brought together boys from different classes for the first camp back in 1907. On the 1st August 2007, Brownsea Island will become the focus of Scouts worldwide as the island hosts the World Sunrise Ceremony. At 8am on the 1st August, Scouts all over the world will renew their Scout promise - the focus being to make the world a better and more peaceful place. ↑ "The Siege of Mafeking". British Battles.com. http://www.britishbattles.com/great-boer-war/mafeking.htm. Retrieved July 07. ↑ Woolgar, Brian; La Riviere, Sheila (2002). Why Brownsea? The Beginnings of Scouting. Brownsea Island Scout and Guide Management Committee. ↑ Beardsall, Jonny (2007). "Dib, dib, dib... One hundred years of scouts at Brownsea". The National Trust Magazine (Spring 2007): pages 52-55. ↑ Walker, Johnny. "Scouting Milestones - Brownsea Island". http://www.scouting.milestones.btinternet.co.uk/brownsea.htm. Retrieved 2006-07-07. ↑ "National Trust - Brownsea Island - History". http://www.nationaltrust.org.uk/main/w-vh/w-visits/w-findaplace/w-brownseaisland/w-brownseaisland-history.htm. Retrieved July 07. ↑ "Brownsea Island Scout & Guide Camp". http://www.brownsea-island.org.uk. Retrieved July 07. This page was last edited on 7 November 2015, at 11:52.